Traveling is something which is enjoyed by most of us. But I guess, the most difficult part for all of us in our journey is packing and some packing tips would be great. Am I right? We often face space and organization problems while packing for our trip. In Fact, sometimes packing becomes so worse that people start hating it. Now I am not one of these people. 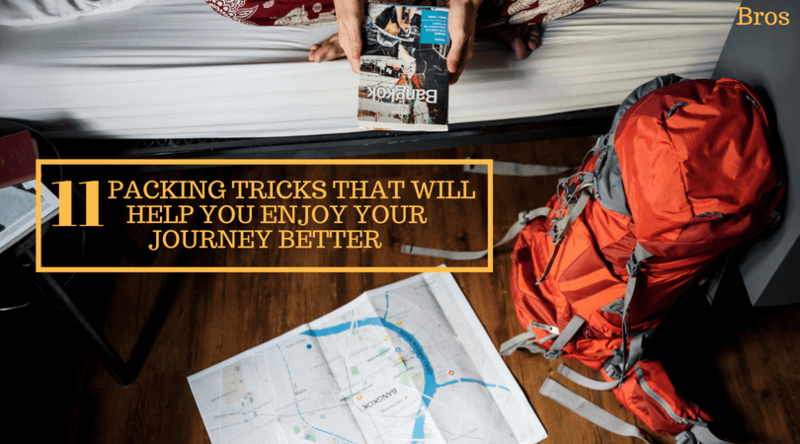 I found and adopted certain packing tips and hacks which made packing easier and more organized for me. These packing tips are easy to implement and also saves space. So, have a look at my tips for packing below and let me know what you think about them. Put masking tape around the lid of toiletries to prevent leakage and free up space because then you don’t need to store them in a separate toiletry bag. For additional safety, you can put in a Ziploc bag if you are concerned about it leakage. Even if it leaks after putting in a Ziploc bag, the leak will be restricted to the Ziploc bag. An alternative to this is covering and sealing the lid with cling wrap. A good trick to save the space from getting littered. While traveling, I always use a sunglasses case for storing charger cables, earphone, and other USB wires. Whenever you need any of the cables, you don’t have to search and disturb the entire suitcase. It keeps the wires tangle free and unorganized. Also, you will get a separate and proper space for these most needed things. Maximize the space by rolling up the clothes instead of folding. It is a very easy method and saves a lot of time otherwise spent in folding the clothes. Clothes on rolling are safeguarded against wrinkles. I usually roll up small clothes and make a layer of them in my suitcase followed by a layer of folded clothes. This saves space and at the same time keeps the suitcase organized. I introduce a layer of folded clothes so that the next layer of rolled up clothes get a plain surface, thus causing the least damage to clothes while traveling. While traveling, I never keep empty shoes in my bag. I stuff them with socks, bracelet, other small items. You can even keep your fragile items such as sunglasses, perfumes, small glassware in your shoes. Your shoes will provide them with an extra cushion for protection. This also saves the space which would otherwise have been used by those things. So don’t let the space in your shoes go waste by keeping them empty. This is among the best packing tips for travel as it utilizes space properly. I know this trick is very common and you might be knowing it. But if you aren’t practicing it, then you should start doing it now. It helps I preventing the clothes getting dirty because of shoes. I keep the shoes separate from rest of the clothes by keeping them either in a plastic bag or shower cap. You should avoid carrying an extra pair of shoes in your bag. Try to restrict to the footwear you will be wearing while traveling. You can do this by selecting that pair of footwear for your travel which matches and can be worn with most of your outfits. If you are carrying a hat, you can prevent it from getting squished by folding a t-shirt and stuffing it in the inside of your hat. I do this as it has two advantages: it keeps the hat in good condition and it provides space for a t-shirt. Worried about the handling of your delicate and expensive dresses while traveling? To ensure their safety, roll delicate dresses between two sheets of white tissue paper. On doing that, those sheets will care for your dresses. Arrange the heaviest items closest to the wheels of the suitcase. On not doing so, the entire weight of the heavy items is transferred to delicate and less heavy items near the wheels while moving the suitcase, thus damaging them. Arranging the heaviest items near the wheels keeps the other stuff safe while moving the suitcase. Use a unique suitcase to reduce the risk of getting it exchanged with some other person while traveling. The uniqueness may be in the form of color, pattern, your name inscribed on it, or unique marks. Packing cubes help greatly in keeping your things organized. It compartmentalizes your suitcase, making it easy for you to find something without messing up with the entire suitcase. To keep your pair of earrings together, put them through the holes in a button. A simple as well as efficient ways to keep your earrings organized and reducing the risk of them getting lost. We shared what we found and did our bit, now it’s your turn to help us share and spread the knowledge! Was packing always easy for you? What are the tricks that you use while packing? Now, we hope you found the packing tips useful, and if you have any other tips for packing, comment it below. We would be happy to hear from you!